Author: Long, Elgen M.; Long, Marie K.
New book, some shelf wear to cover. 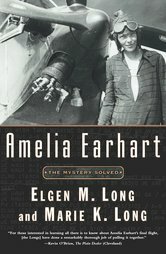 With the recent discovery of long-lost radio messages, combined with the authors 25 years of research, the mystery surrounding Earhart has been solved. The book simultaneously reveals the findings and brings to life the primitive conditions under which early aviators flew.